In Adobe Photoshop everything I type shows up in capital letters. I’m not in caps lock. I have no idea what the problem is. How to fix this problem? Now click on TT button in bottom of window now it should solve your problem. 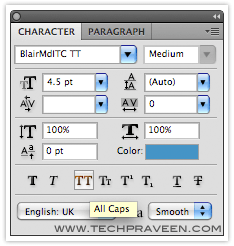 Just highlight the text you typed and press Ctrl+T on the keyboard, and it should bring up the character palette. Dude, thank you so much for this tip! I was just about to start cleaning my keyboard to see if the Capslock key had dirt under it or something, I couldn’t figure it out. Now everything’s working again like it should. THANK YOU! I was getting super frustrated, I knew it had to be something simple!!! Feb. 2016 and still working ! great!